← Monthly subscription music services – WINNER! 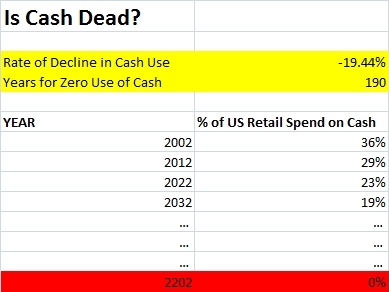 The last days of cash? There has been much talk over the years about the irrelevancy of the U.S. penny. The report in 2012 from Bloomberg was that it actually costs 2 cents to make one penny. With a nickel it’s just as bad – 11.2 cents for each nickel. Apparently this has President Obama’s attention. To take that idea a bit further, how long will it be until cash is completely obsolete? I imagine it would not be very difficult for an individual to live a year or more today without having ANY cash at all. Debit cards and credit cards (ok and maybe even Bitcoins) could be used and for those that live in a major city it is not far-fetched to think of many people not using any cash for days, weeks, or even months at a time with no real issue. Paypal wants you to think this way. In an article in the Daily Mail the suggestion from Paypal is that cash could be obsolete in three years. Granted this is a totally self-serving piece from a company that has much to gain from a completely cash-less society. Maybe you’ve seen the Chase television ad in which the babysitter collects her fee electronically from the cool young parents on the Chase Quick Pay service associated with her debit card. By the way we had lots of babysitters over the years but none were as cool as Olivia. I have no real attachment to cash except that it is not trackable – or at least easily trackable. I doubt I have too much to worry about when it comes to marked and unmarked bills. Still it will be a different world indeed if I never have to carry a money clip, loose change or any ‘legal tender’. What do you think? Are you ready for a cashless world? This entry was posted in Consumer Attitudes, Consumer Behavior, Living in the World Today and tagged Cashless society, Chase Quick Pay, cost to make a nickel, cost to make a penny, debit cards, eliminating cash, end of cash, getting rid of cash, getting rid of pennies, when will cash be obsolete. Bookmark the permalink. 2 Responses to The last days of cash? I’m not ready yet, but I might be getting there. For anything over $10 I use a credit card (never a debit, though). In fact, I wish the Chase ATMs would dispense cash in 10s only, not 20s. Whenever I have to cash a $100 or $50 (as my roommates pay me their share of the rent in cash), I ask for 10s. One danger in total credit card or mobile phone purchase is the tendency to lose track of spending (& overspend). But as long as one is careful, this is certainly less cumbersome. Sounds as if you are quite ready Hallie – it just has not yet been made easy or attractive enough for you. That will happen soon I believe.